On a weekend when upsets were dominated the national scoreboard, the Terriers were one of the victims, falling 5-1 to UMass in Amherst on Friday evenng. Zach Cohen was the only Terrier to put a puck past Minuteman goalie Paul Dainton, scoring early in the third period. Recaps from USCHO and HockeyEastOnline. BU is back in action Sunday night, hosting Northeastern. Terriers (6-1-0) head West on the Mass Pike tonight to take on UMass (4-2-1), coached by former BU assistant head coach, Don Cahoon, a member of BU’s 1971 and 1972 national championship teams. The GoTerriers site preview has links for game notes, gametracker and the radio broadcast. The Daily Free Press previewed the game and USCHO’s Dave Hendrickson looks at each Hockey East team’s progress in his weekly column. BU Sports Information Director Brian Kelley will be blogging live throughout tonight’s game. Access it here. Brian Durocher's 7th-ranked women's team returns to the ice today in New Jersey, taking on Princeton at historic Hobey Baker Rink. They are currently riding a seven-game unbeaten streak. Rob Davies, a Terrier forward from 1978-1982, is now in his 9th season as head coach at Curry College. The Colonels are expected to be a top contender for the Division III ECAC North Conference title. Assisting Davies is Adam Warsofsky, brother of current BU freshman blueliner, David Warsofsky. A third brother, Ryan, plays for Sacred Heart. Hockey East held a midweek press conference with several league coaches commenting on early-season action. Terrier Coach Jack Parker discusses the team’s success to date and the weekend’s matchups with UMass and Northeastern. The full transcript is here. A USAHockey.com feature looks at senior wing Jason Lawrence’s development during his two seasons in the NTDP program in Ann Arbor. Colin Wilson’s 4-point game vs. Lowell earned him a spot on The Hockey News’ Hot List. Red Wings Central, assessing top prospects in the Detroit organization, commented on 2009 recruit Max Nicastro, a third round draft pick in 2008. D Max Nicastro, Chicago (USHL). He's billed as a jack-of-all- trades, master-of-none, and that's a great compliment for any defenseman. Nicastro is one of the top blueliners in the United States Hockey League, and he could emerge as one of the organization's best prospects at Boston University. Nicastro, rejoined the Chicago Steel after a successful stint with gold-medal winning Team USA in the World Junior A Challenge in Camrose, Alberta. 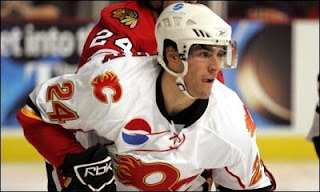 He served as an assistant captain on the U.S. squad. He helped the Steel to a 5-4 win over Waterloo last night. DJ Powers of Hockeysfuture.com examines the rise of college hockey talent from California. The Golden State currently has 41 Division 1 players and more on the way, including the aforementioned Nicastro,who is a product of the the Los Angeles Jr. Kings' organization. The NTDP U17s, coached by ex-Terrier John Hynes, show four of twelve forwards on the roster from California. College hockey thrived in California in the 1920s and 1930s. For a brief history of college hockey in California, check this site. Finally, from The Daily Free Press, two good reads: Coverage of the Jack Falla Memorial Fund benefit held last night at Agganis Arena, and a look at the balance between academics and athletics for BU's varsity athletes. The Terriers’ sixth win of the season, combined with losses by Colorado College and Boston College, has vaulted BU to the top of both national polls. 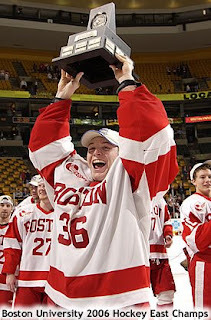 The BU athletics Web site release notes that “BU last held the top billing in the country in the final poll before the 2006 NCAA tournament.” That poll followed BU’s 2-1 overtime win over Boston College in the Hockey East championship game. Hockey East’s weekly news release reported that Colin Wilson earned RBK Player of the Week honors for his four-point effort against Lowell. Kevin Shattenkirk and Jason Lawrence previously won the award this season. In the NHL, a pair of 1998 BU All-Americans found the back of the net. Tom Poti’s second goal of the season got Washington on the board early in a 4-2 win over Tampa. Chris Drury knocked in the tying goal with just one hand for the Rangers, who lost in a shootout to Edmonton, 3-2. 2009 recruit Alex Chiasson scored his fourth goal in the past five games as Des Moines dropped a 3-1 decision to Lincoln on Saturday. Chiasson is the Buc's leading goal-scorer. 2009 reruit Max Nicasto (photo, #2) helped Team USA, made up of USHL Selects, to the World Junior A Challenge title in Camrose Alberta. In the title game Sunday evening, USA beat Canada East, 7-1. Nicastro, a Red Wings’ third round draft choice, finished at 1-3-4 in 5 games--including a powerplay goal in the championship game, good enough for 3rd place among all defensemen. A year and four days after BU rallied from three goals down to beat UMass-Lowell, the Terriers needed to come from behind twice to beat the River Hawks, 6-4. Colin Wilson’s (photo) second consecutive two-goal game included the game-winner with 14.5 ticks left in the third period. Senior Chris Higgins also bagged a pair. 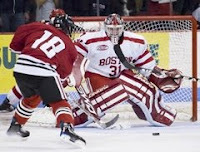 We have detailed recaps from USCHO and the BU Athletics Web site. Freshman goalie Kieran Millan improved his record to 4-0. Wilson’s 12 points puts him in a tie with fellow sophomore Nick Bonino atop the scoring leaders chart in Hockey East. Four other Terriers, Higgins, Brandon Yip, Jason Lawrence and Colby Cohen, are in the top 14 and Kevin Shattenkirk, with five assists in the past three games, is tied for 15th. Third-ranked BU (5-1-0) is on the road tonight, taking on UMass-Lowell at Tsongas Arena. Lowell, coached by former BU assistant Blaise McDonald and assisted by former Terrier standout and Hall of Famer Shawn McEachern (photo), is 3-2-0 after five games, but has yielded just six goals this season. BU gamenotes include links to gametracker and the audio Web cast. The Daily Free Press previewed the contest and USCHO’s weekly Hockey East column looks at all conference games. It’s hard to believe that, prior to last night, Rangers captain Chris Drury had scored just one NHL hattrick. But that’s a fact. His second came against Tampa and included a shorthanded breakaway that left the Lightning goalie sprawled on the ice and the net wide open. Keith Tkachuk took another step toward the 1,000-point milestone with his 10th goal of the season last night as the Blues were edged by the Sharks, 5-4. He's now at 994 points. Ex-Maine Black Bear Ben Bishop was in goal for St. Louis. Please join the Boston University community for the Jack Falla Memorial Fund Fundraiser on Wednesday, November 12th at BU's Agganis Arena. Jack Falla, who passed away unexpectedly in mid-September, was a BU alumnus, Sports Illustrated writer, BU professor, and a long-time member of the hockey community. We will celebrate Jack with the screening of the documentary Pond Hockey (which was inspired by Jack's book Home Ice), a reception, silent auction, and an open skate on Jack Parker Rink. The event will be held on Wednesday, November 12th from 6-9:30 PM. Doors open at 5:30. You must RSVP if you wish to attend. Please go to www.bu.edu/com/jackfallafund to RSVP, donate, or for more information and details. Additionally, we have some terrific auction/raffle items including autographed hockey jerseys from Wayne Gretzky and the 2008-09 BU Men’s Hockey Team, Red Sox tickets and autographed items, Celtics tickets, Chicago Cubs tickets, and much more! The Jack Falla Memorial Fund will benefit future Boston University, College of Communication sports communicators and sports journalists. For those interested in acquiring bracelets and/or making a donation but unable to attend a game at Agganis Arena, please contact Peggy Gilroy at fpgilroy@aol.com. Member of the BU Friends of Hockey organization. This September she passed away from thyroid cancer. The Men’s ice hockey team is asking that you wear this bracelet, especially to games, in memory of a person who worked tirelessly on our team’s behalf. game— the one that really counts. Thank You. Update on Chiasson: U.S.Hockey Report, covering Alex Chiasson’s commitment, points out that many colleges had been following Chiasson and that BC, Michigan and Vermont were among the finalists for his verbal. USHR quoted Northwood Prep coach Jeff Matthews saying “He’s great along the half-wall and in the corners,” and also suggests he’ll be an early round NHL draft choice next June. World Junior A Challenge: Max Nicastro, another 2009 recruit and Chiasson’s rival in the USHL, is playing for Team USA in the World Junior A Challenge in Camrose, Alberta. In last night’s 5-3 win over Canada East, Nicastro had an assist. 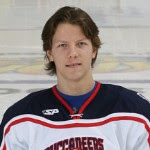 BU has received a verbal commitment for 2009 from one of the top power forwards in junior A hockey, Alex Chiasson of the Des Moines Bucs of USHL. A native of Quebec, Chiasson, a 6-3.5, 187 lb., right wing and center, was recently given an “A” rating on NHL Central Scouting’s players to watch list for the 2009 draft. While his skating needs to gain a step, he has really nice hands and puck skills. Alex has to mature a little in gaining some strength, but he is a solid competitor who comes to play every game, every shift. He’s very good on faceoffs, has creative puck skills, works the corners, and goes hard to the net. He has all the assets to make a very good college player and solid potential to play at the next level. He is a great kid, is having a solid year in the USHL; if Bonino and Wilson stay, BU will be endowed with three outstanding centers. Chiasson’s coach in Des Moines is former NHL star J.P. Parise, father of Devils’ forward—and former North Dakota standout—Zach Parise. Following September’s USHL Fall Classic in Sioux City, U.S. Hockey Report evaluated top NHL draft prospects and reported “The two forwards we liked the most in terms of their total game were Louis Leblanc and Alex Chiasson.” Leblanc, also from Quebec, had made his final choice between Harvard and BU, electing to skate for the Crimson in 2009. Right now, the college guys are closely following junior Alex Chiasson, a 6’3”, 175 forward from Quebec City. As an Oct. ’90 birthdate, he won’t be eligible for the NHL draft until ’09. Matthews says Chiasson wants to keep his college options open until the end of the school year. He’s a good student and should have his pick of schools. Last month, as his stock as a top college prospect continued to rise, Chiasson was interviewed by McKeen’s Hockey Prospects editor Kevin Wey about his development as player, growing up in Quebec and moving on to Northwood, and his college interests. Also last month, another McKeen’s editor, Vincent Montabalo, ranked him the top 1990 uncommitted prospect. In Chiasson's most recent game, a 2-1 Des Moines shootout win over Indiana, he scored the Buc’s tying goal and then added another in the shootout. The Terriers earned their fifth goal in six starts last night, 7-2 over Vermont in Burlington. BU was clinging to a one-goal lead late in the middle stanza when senior Brandon Yip (photo) scored off a clean faceoff win by sophomore Nick Bonino, who co-leads all conference players with eleven points. Three goals in the final period sealed the win. Yip also nailed Catamount forward Peter Lenes with an apparently clean open-ice hit, but drew a penalty anyway. Colin Wilson got the Terriers off to a fast start with a pair of goals in the first period. We have links to game recaps from USCHO, Hockey East Online and College Hockey News. The BU athletics recap noted a milestone achievement on the defensive side of the puck. "With the 7-2 final, the Terriers have held their first six opponents to two goals or less - a feat that never happened in the program's previous 87 seasons." Islanders goalie Rick DiPietro underwent knee surgery and will miss 4-6 weeks...Devils forward Jay Pandolfo got off the schneid and scored his first goal of the season in a 6-1 win. Terriers take on the always tough Vermont Catamounts at Gutterson Rink tonight. BU gamenotes and links to gametracker and the radio broadcast are here. The Burlington Free Press offers a game preview article. Dave Hendrickson's weekly HockeyEast column on USCHO looks at the weekend's schedule and early season trends in the conference.